For the first time in ten years, WestPapuaMedia has taken a long break from regular publication as we focus on improving our infrastructure, and work on several innovative new projects that will support credible, quality journalism on the ground in West Papua. Without a sustainable funding base and savings in the bank, we were unable to ethically provide the correct amount of support currently needed for our brave clandestine stringers and journalists to expose themselves in the field. We are still working hard to create the mechanisms so that they are armed always with real time digital security and support when they do venture into the field, and are able to report safely. These mechanisms of course, we are working to develop so that anyone who needs to tell a story of their world – in Papua to begin with – is able to do so, and have their voice heard, and treated with respect. and out of context torture photos and misreporting is creating a situation where social media is now dismissed by the powerful around the world as rumour and propaganda. This work being researched will support the capacity of West Papuan people inside West Papua to get their own voices heard with the stories they want to tell. Not the stories that outsiders want told for their own clickbait donation agendas, or misreported, or not told full stop. It breaks our hearts that we cannot cover the issues West Papua needs reporting to the world at this point, but we have a commitment to not put our folks in danger. We want to be able to support every rally, every campaign, and to be able to tell every story West Papuans want to tell the the world, especially of those sectors of the population that don’t get a voice currently. Our return in 2019 can only happen with your generous and sustainable support. WPM supporters and members will be creating a major crowdfunding campaign and donation before our return, and we will be going for an “all-or-nothing” model to ensure that we can cover the expensive costs of safely supporting clandestine journalists in the field – and having the resources to provide the protection and cover that they need to report safely, and to enable professional media creators to deliver high quality and factual multimedia reporting. We will of course continue to assist foreign journalist to bypass the media ban in West Papua by assisting with SAFE organisation and fixing for undercover stories. However our main focus is to continue our pioneering work of the last ten years ensure that Jakarta’s Foreign Media Ban is redundant, through the effective and strong real time multimedia reporting capacity of indigenous Papuan journalists is supported. So our current work for the rest of the year will be focused on organising West Papua Media’s back archives, our digital media assets, and also restructuring our project to deliver a more robust, intuitive and involving website, with the ability for people on the ground to collaborate with us, safely, with their identities and locations safe. We will be creating an innovative new digital asset library, with new technologies of verification and safe asset tracking (that will not put the creator’s security at risk) that will ensure that any creative content, whether photos, videos, or any content and artwork provided to us, will be able to be tracked across the internet, and to enable licensing that will mean money will flow back to the creators so they can sustain their work (and get new equipment etc), or to enable training and supply to new witness journalists to operate effectively and safely. We have a big checklist of tasks to get through, and welcome anyone’s assistance to make this a reality. Please contact us via our contact page if you would like to assist. You can of course donate to us via a variety of methods, just visit westpapuamedia.info/donate . We really need your generous financial support to enable this to be reborn in early 2019. A major crowdfunding campaign will begin late October, and we will be on a contributor and collaborator hunt – especially those who would like to mentor and support individual Papuan journalists in their continued development. Developing a new series of training curricula for digital security and practical safety for frontline clandestine witness and professional journalists to be rolled out for 2019. Tailoring our unique and unprecedented JournoTriage News prioritization system. EyeSAFEMoJo’s JournoTriage Process for Civil Resistance and Human Rights Journalism is a simple concept that adopts traditional newsroom story prioritisation, combining it with the highly effective and universal First Responder’s Mass Casualty Assessment tool. JournoTriage combines a material (Security, political, repressive, casualty, legality and impunity) conditions crisis assessment of standardised coding system that is understood immediately by journalists, human security, medics, counter-disaster and international agencies -instantly. hoping to transform the ability to collect credible, verified and scientifically tested evidence of human security information that can be utilised by journalists, editors, human rights organisations and International bodies to effect real time monitoring and intervention of abuses. 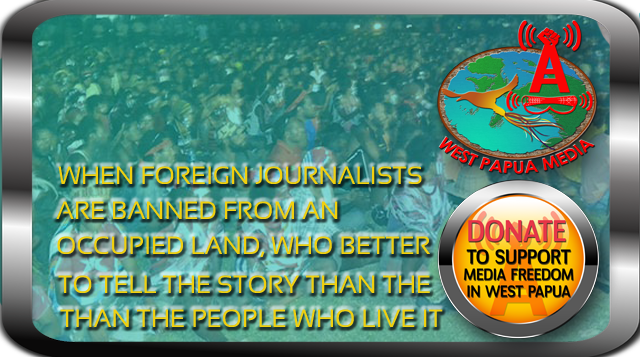 For up to the minute WestPapuaMedia tweets, please refer to embedded Twitter box below. Keep me posted about the safe media technology i heard through the grapevine that journos can auto record and instantly upload the footage live, with their inbuilt phone camera… simply by using some kind of app. Let me know what its called and how to download it so live footage can be uploaded in real time. That will be in the SAFEapps list coming out soon. Many journos use periscope, but this is NOT safe for repressive environments.